As part of GIPHY's forthcoming "Loop Dreams" exhibition. As the old saying goes, a GIF is worth a million words, and there's no better evidence of this than the fact that GIPHY will be hosting Loop Dreams, a comprehensive exhibition of some of the Internet's best GIF art exhibit, this Sunday. Even better? It's IRL. 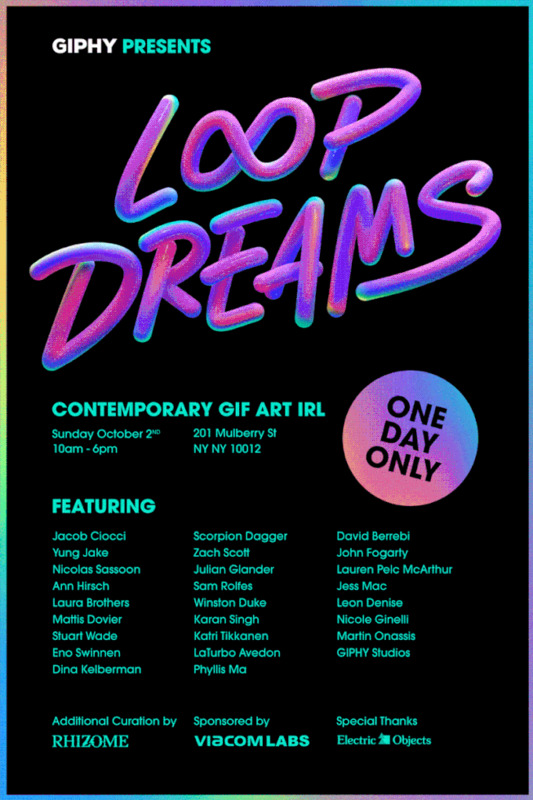 That's right, a one-day only pop-up event showcasing the online work of 25 GIF artists, Loop Dreams will be transforming a small space in New York's SoHo neighborhood into a multimedia museum of projections, virtual reality, interactive installations and holographic posters. And with additional curation courtesy of Rhizome, as well as works from the likes of influential multimedia artist Jacob Ciocci, emojilord Yung Jake and tech-feminist Ann Hirsch, this exhibition is undoubtedly a comprehensive look at every prominent, pixel-savvy artist working today. So alongside a couple debut images made especially for Loop Dreams, we spoke to three GIPHY-chosen artists -- Phyllis Ma, Katri Tikkanen and Julian Glander -- about synesthetic images, their wide-held fascination with certain aesthetics and what makes the GIF an ideal artistic medium. For starters can you tell me a little bit about yourself and your practice? I'm a 31-year old graphic designer and illustrator living in Helsinki, Finland. I have worked in the field of graphic design for several years with a focus on doing more illustration work. At the moment I'm working as a freelancer and trying to figure out my next big career move. What drew you to GIFs as a medium? I'm constantly dreaming of animating my illustrations into short films or music videos, and I see GIFs as a fun and easier way to practice my animation skills. Tell me a little bit about the work you're exhibiting as part of Loop Dreams. My work for Loop Dreams is called 'BFF'. It's a detailed portrait of my hand holding a cell phone -- my favorite accessory -- the one I love and hate and can't live without. What draws you to the very pastel pink, "soft girl" sort of aesthetic? What does utilizing this aesthetic mean to you in terms of your artistic practice? I have been drawn to the soft, girly aesthetic for a long time. While studying graphic design, I was constantly surrounded by minimalistic and often very masculine ideals, and it took a while for me to let my super-feminine fantasies come to life. I used to be obsessed with sparkly 80's airbrush art and slowly started to come up with a technique that combines soft gradients with photorealistic elements. Now I see my illustrations as detailed observations of life in a super-feminine Photoshop fantasy. I am inspired by the stereotypical commercial girly aesthetic and how it seems to disappear slowly from children's lives as they grow up. The conflicts between girlishness and adult-life puzzles me. And maybe my illustration style has also developed out of curiosity to see how it feels to create something extremely cute and feminine and present it in a "mature" and detailed technique. Why choose to center your gifs mainly around sparkles? Why make glittering jewels the centerpiece of your works? I love glitter! Sparkles are hypnotizing and they make ordinary things feel special, that's why I love to use them especially when animating my work. I'm a 3D art guy based in NY. Lately I've been working in comics, video games, animated shorts, and of course the smash hit file format called .gif, as well as developing an animated series. Basically I am just in front of a computer all day making little pastel friends for myself. Some people have said they wanted to eat my art, which is the best compliment. I have so much energy that I want to share with people and the gif a perfect format for that; a little 540px square can have so much action packed into it. I also really like when people use my GIFs as reaction images for emotions/feelings/situations I never would have thought of. The piece is called long_worm.gif, it's a study in the illusion of depth. Confronting perceptions of dimensionality, the piece uses the motif of a many-segmented creature to confront perceptions of dimensionality, specifically the human inability to accurately process light waves as they truly exist. long_worm.gif would look great in a rich person's bathroom. I noticed you also occasionally contribute comics to Vice, which is further testament to how humorous your work is, how you'd get involved with them? Hmmm, last year I sent Alex Schubert a bunch of tweets about how much I liked his Blobby Boys comic on VICE -- and a little while later he went on vacation or something? So he asked me if I wanted to do a guest strip. I had never written a comic before but I really wanted to impress him so I whipped one up, and after it ran, Nick Gazin [the Vice comics editor] asked me to do more. A Cinderella story, I know. Out of curiosity, what exactly fascinates you about worms? Hmm, not something I've ever thought about consciously before. They're just so funny! They're like snakes except they can't cause too much trouble. Basically if little shoelaces came to life and ate dirt, that would be worms. I want to ask a worm, "why do you exist? what's your angle here? you're so goofy and it seems like the way you wiggle around is really inefficient." I can relate to that. I studied fashion design and I worked as a window dresser– both experiences have become sources of inspiration for my practice. My work spans a few mediums: GIFs, stop motion animations, photography, clothing. It's humorous reflections on consumerism–specifically beauty, fashion and food. I'm also half of LAZY MOM, a food-based collaboration with artist Josie Keefe. GIFs are magical! They have the ability to be very simple and very complex simultaneously. Even at the most basic level, a two-framed GIF can express so much. And the ability to endlessly loop an animation can echo profound thoughts about human existence, similar to a mind expanding drug or meditation experience. Cut and Sew is an enormous button down shirt (6 feet tall!) superimposed with animations of everyday objects. In fashion terms, a cut and sew garment is one made from scratch, out of raw fabric. The piece plays with this idea by re-purposing the scale, colors and textures of mass produced items like lipstick, toothpaste and toilet paper onto the canvas of a common shirt. Texture seems to play a big role in your gifs alongside, can you tell me a little more about this? What textures in particular are you drawn to? Do you feel like gifs are the best medium to emphasize the idea of 'texture'? I'm drawn to familiar textures in visceral (and sometimes gross) combinations. For instance, in Cut and Sew, the patterns on the shirt are interpreted with toothpaste, lipstick and ramen among other things. Through looping, GIFs have the ability to simulate endlessly shifting texture. A lot of your GIFwork deals with themes of consumerism and consumption -- whether it be a rendering of the ubiquitous manicure parlor hand, tubes of lipstick or a bag of Cheetos -- can you talk a little bit about that theme? I like creating a synesthetic mixture of colors and objects that blur the relationship between consumption and production. I tend to adapt the technical skills that I've learned through fashion and window dressing in a playful and useless manner. As a New Yorker is who constantly surrounded by retail environments, it's also a way for me to utilize the language of mass production to reflect on my conflicted feelings on commercialism. One of the places I go to often is the dollar store in my neighborhood, where I find props for my animations. The variety and clutter of cheap plastic products is so intensely beautiful and ugly at the same time. I try to bring this feeling into my work while giving these consumer objects a second life free of its intended purpose. GIPHY's Loop Dreams exhibition is open to the public this Sunday, October 2nd.